Want to visit the emergency room– or worse? Tackle tree work. 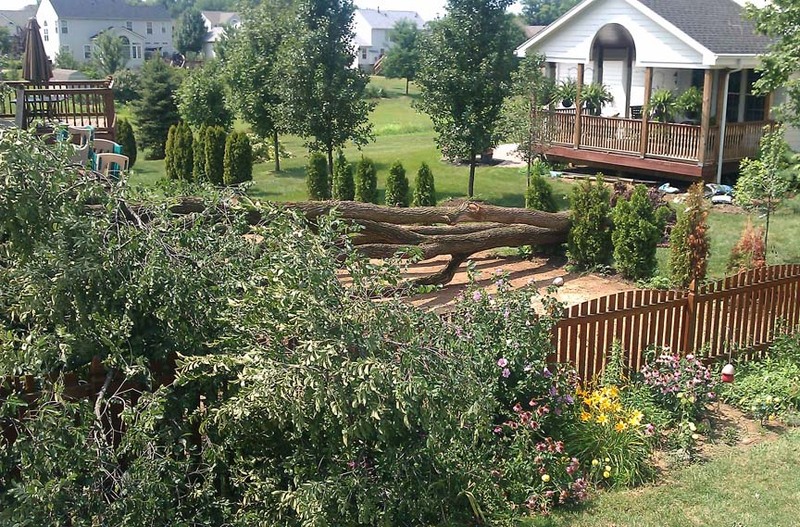 A recent Ohio State University Extension newsletter warned of the dangers amateurs face when cleaning up storm damage with a chainsaw. Curtis Young, lead editor of the weekly Buckeye Yard and Garden Line, got my attention and dissuaded me from borrowing the neighbor’s saw. Why? Ear and eye protection are musts. Two hours of chainsaw racket can mean hearing loss. An eyeful of sawdust or metal dust, should the blade hit a nail or other object in the wood, may mean vision loss — instantly. Watch out for “trunk kick back” or the “sudden splintering of the trunk as it is being cut.” Pieces could hit the saw operator or, as the trunk shifts, pin the operator on the ground. Logs can roll onto legs and feet. Live wires tangled in the tree — ZAP! — possible electrocution. This one reminds me of comments from my landscape maintenance instructor. He knew guys with patterns of metal watch bands and belt buckles branded into their flesh from such electrifying encounters. They were lucky. A good rule of thumb I’ve heard: If the work requires a ladder, call an International Society of Aboroculture certified arborist to make recommendations.